Browse for meters by vehicle make and model. Handlebar mount 24 Volt battery status, power on, and headlight on indicator. Battery status indicator is calibrated for lead acid battery packs. Top; yellow light for 25% and three green lights for 50%, 75%, and 100% battery status. Bottom; red light for low battery warning, green light for power on, and yellow light for headlight on. 68" power cord. Red wire +24V power on, black wire ground, and white wire +24V headlight on. Fits standard 22mm (7/8") bicycle and scooter handlebars. Handlebar mount 36 Volt battery status, power on, and headlight on indicator. Battery status indicator is calibrated for lead acid battery packs. Top; yellow light for 25% and three green lights for 50%, 75%, and 100% battery status. Bottom; red light for low battery warning, green light for power on, and yellow light for headlight on. 68" power cord. Red wire +36V power on, black wire ground, and white wire +36V headlight on. Fits standard 22mm (7/8") bicycle and scooter handlebars. Handlebar mount 48 Volt battery status, power on, and headlight on indicator. Battery status indicator is calibrated for lead acid battery packs. Top; yellow light for 25% and three green lights for 50%, 75%, and 100% battery status. Bottom; red light for low battery warning, green light for power on, and yellow light for headlight on. 68" power cord. Red wire +48V power on, black wire ground, and white wire +48V headlight on. Fits standard 22mm (7/8") bicycle and scooter handlebars. Handlebar mount 24 Volt battery status, power on, and headlight on indicator. Battery status indicator is calibrated for lithium-ion and LiFePO4 battery packs. Top; yellow light for 25% and three green lights for 50%, 75%, and 100% battery status. Bottom; red light for low battery warning, green light for power on, and yellow light for headlight on. 68" power cord. Red wire +24V power on, black wire ground, and white wire +24V headlight on. Fits standard 22mm (7/8") bicycle and scooter handlebars. Handlebar mount 36 Volt battery status, power on, and headlight on indicator. Battery status indicator is calibrated for lithium-ion and LiFePO4 battery packs. Top; yellow light for 25% and three green lights for 50%, 75%, and 100% battery status. Bottom; red light for low battery warning, green light for power on, and yellow light for headlight on. 68" power cord. Red wire +36V power on, black wire ground, and white wire +36V headlight on. Fits standard 22mm (7/8") bicycle and scooter handlebars. Handlebar mount 48 Volt battery status, power on, and headlight on indicator. Battery status indicator is calibrated for lithium-ion and LiFePO4 battery packs. Top; yellow light for 25% and three green lights for 50%, 75%, and 100% battery status. Bottom; red light for low battery warning, green light for power on, and yellow light for headlight on. 68" power cord. Red wire +48V power on, black wire ground, and white wire +48V headlight on. Fits standard 22mm (7/8") bicycle and scooter handlebars. Rectangular shaped 12 Volt battery condition meter. Voltage scale reads 0-15 Volts DC. Panel mount design. 1/4" tab terminal connectors located on back side of meter. Include brass mounting bracket. Fits into 3/4" wide x 1-13/16" high rectangular opening. Waterproof, dustproof and shockproof digital Voltmeter. 15-120 Volt DC Voltage range. Works with 24 Volt, 36 Volt, 48 Volt, 60 Volt, 72 Volt, and 96 Volt battery packs. Textured anti-glare display screen for easy daytime viewing. Three 9/16" tall LED displays. Reverse polarity protection. Refresh rate 500ms/s. Power consumption 15-20mA. Screw terminal connectors on back side of meter. Includes removable 7" long power leads. Panel mount design. Cutout size 36mm wide x 20mm high. Dimensions: 40mm x 25mm x 23mm. No mounting hardware required. Has built-in plastic mounting tabs that work with panels up to 1/8" thick and can be removed for mounting into thicker panels. 15 Amp DC rectangular shaped panel mount Ammeter. Built in shunt - requires no external shunt. 1/4" tab terminal connectors located on back side of meter. Includes brass mounting bracket. Fits into 1-13/16" wide x 3/4" high rectangular opening. Works with any DC Voltage range. 50 Amp DC rectangular face panel mount Ammeter. Panel mount design. Includes external shunt. Threaded brass post connectors on back side of meter. Dimensions: 2-13/16" wide x 2-7/16" high x 1-3/4" deep. Fits into 2" diameter round hole. Includes mounting hardware. This Amp meter works with any DC Voltage range. Plastic body with chrome plated finish. Convex shaped polycarbonate lens. Chrome plated steel bezel. Speedometer range 0-60 km/h. 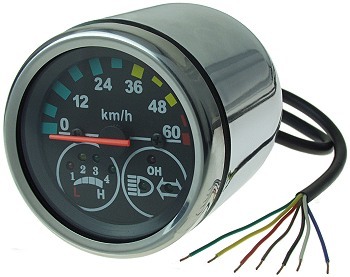 LED indicator lights for power, headlight, and turn signal. Four stage battery pack status level LED indicator lights. 14" long power cable. We carry handlebar and panel mount analog and digital Voltmeters and Ammeters for electric cars, electric motorcycles, electric golf carts, electric scooters, electric bicycles, electric pocket bikes and electric go karts.